Rachel Von | The Journal Gazette The Komets' J.C. Campagna prepares to shoot the puck at Memorial Coliseum. 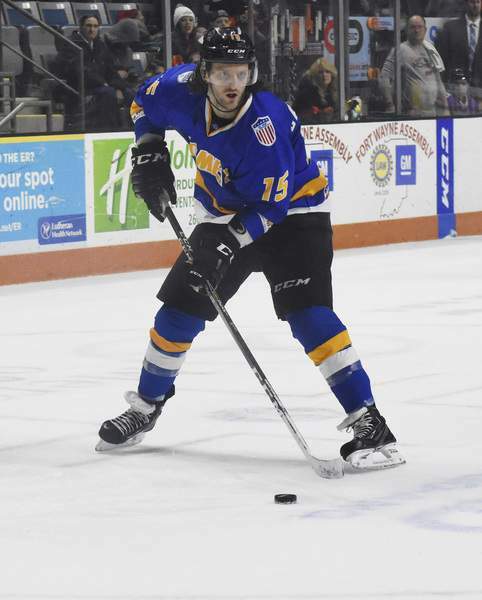 J.C. Campagna, who leads the Komets with 21 goals in 36 games, is headed to Chicago of the American Hockey League, multiple sources confirmed to The Journal Gazette tonight. I've heard he may be back in time for the Saturday game at Memorial Coliseum against the Rapid City Rush, but that's very unclear right now. This will be Campagna's first stint in the AHL. He has 27 points in 34 games with the Komets this season.